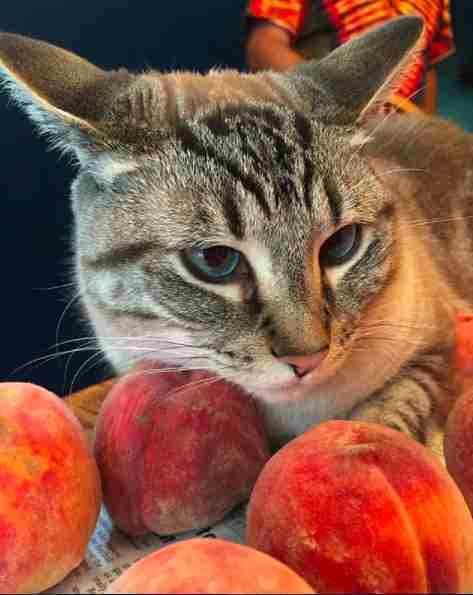 With summer well underway, farmers' markets are full of amazing produce — and one cat couldn’t be more excited that it’s finally peach season. It’s not that Ozzy wants to eat the juicy fruit. 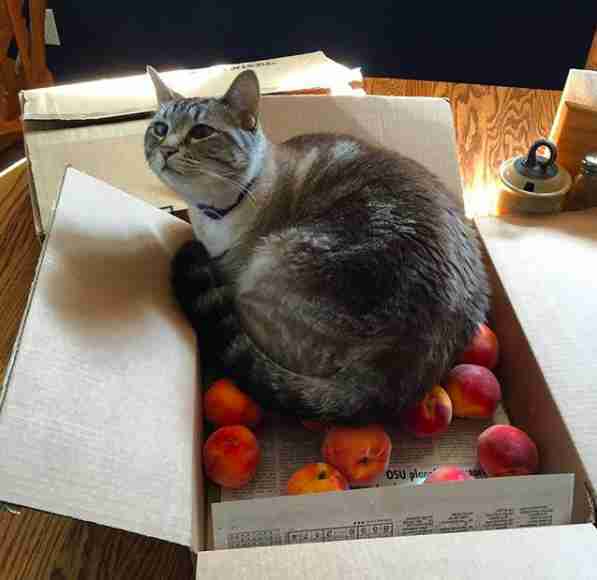 For the 5-year-old tabby, no bed can compare to a pile of fuzzy, ripe peaches. In fact, he even manages to find multiple uses for the downy fruit every time his family brings them home. “He nuzzles them, uses them as a pillow to rest, or just stands over them guarding them,” Lydia Coutré, whose parents own Ozzy, told The Dodo. For years, the cat’s odd habits have delighted his human sisters, Lydia and Lorraine, to no end. 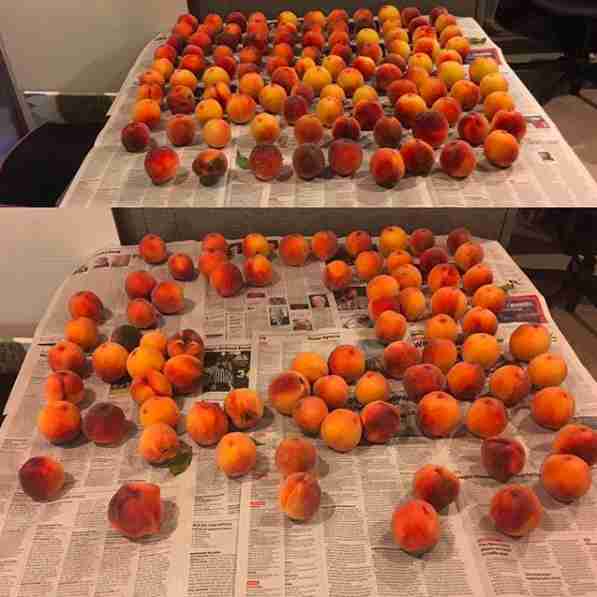 Ozzy’s owner leaves the peaches to ripen on sheets of newspaper — giving Ozzy the perfect opportunity to nest. If Ozzy’s family wants to keep their produce free of cat hair, they have to resort to desperate measures. Ozzy has lived with the Coutré family since he was adopted in the fall of 2013. 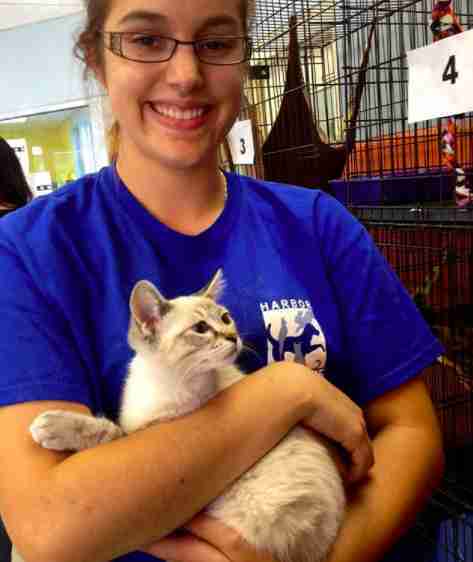 Lorraine and her mother were volunteering at the Harbor Humane Society in West Olive, Michigan, when they decided to take a peek at the cats available for adoption. They weren’t planning on expanding their family at the moment, but when Lorraine spotted Ozzy, it was love at first sight. “I saw Ozzy in the main lobby at the very beginning (his name was Blaze at the time) and couldn't keep my mind off of him,” Lorraine Coutré told The Dodo. “When I finally got to meet him right before we were leaving, he just completely melted in my arms. Mom couldn't say no, partially because I was begging, and partially because it was 'Free Kitten Friday,' and we brought him home!" Ozzy is a playful, cuddly cat in general, but his love doesn’t extend to all circular fruit. In fact, citrus has the opposite effect on him. Ozzy’s strange love affair with the summer stone fruit has since become a running joke in the Coutré family. 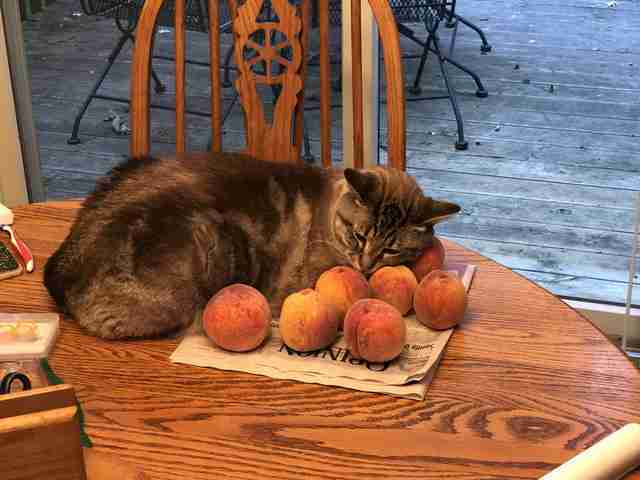 Ozzy’s owners will delight their daughters by sending pictures of Ozzy sleeping among the peaches to the family group chat. Within just a few short days, the post has gone viral with over 60,000 retweets and over 100,000 likes. 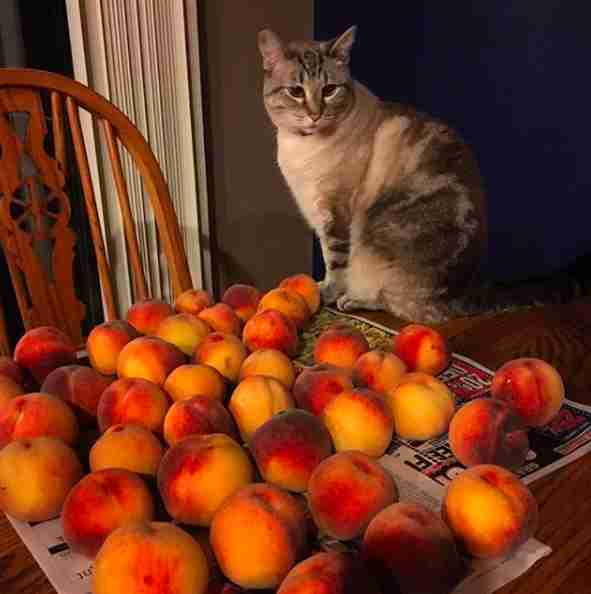 However, Ozzy doesn’t seem to care about how famous he’s become — he’s far more concerned with peach season ending. To learn more about Ozzy and his peachy friends, you can follow him on Instagram.